On Friday’s Countdown show, while appearing as a guest, Newsweek’s Howard Fineman, also an MSNBC political analyst, contended that, regarding her level of experience, Sarah Palin "makes Barack Obama look like John Adams." Host Keith Olbermann called her "the least experienced vice presidential candidate probably in American history," and repeatedly applied labels to her suggesting extremism, calling her "fanatically anti-abortion," "hard right," "global warming denying," a "rabid conservative," a "red meat conservative," and a "fire-breather." Picking up on a joke by Fineman that there are not many "pro-drilling, anti-polar bear, and anti-abortion women" who were Hillary Clinton supporters who would move to support Palin, Olbermann asked Fineman: "Was her real appeal the fact that she is a red meat conservative? I mean, she is, as you suggested, pro-drilling. She’s this side of ‘melt the Arctic,’ this side of ‘imprison abortionists,’ she’s run up the debt, ‘purge the lefties’ fire-breather." Olbermann called Palin "fanatically anti-abortion" in the show’s teaser: "The 20-month veteran, the two-term mayor of Wasilla, Alaska, population 9,236, the mayor who won the award for tree care from the National Arbor Day Foundation in 2002, the governor who was for the 'Bridge to Nowhere' before she was against it -- 'the' Sarah Palin? Senator McCain’s ‘Hail Mary’ described as the biggest political gamble of our time, picking an ex-beauty queen governor on the job only 20 months, fanatically anti-abortion and pro-gun, in a desperate play for Hillary Clinton supporters." During the show’s introduction, Olbermann called her a "rabid conservative" and questioned the level of her experience: "The Republicans have selected the least experienced vice presidential candidate probably in American history – a rabid conservative, seemingly a vague kind of alternative to Hillary Clinton, except that last March, the Governor claimed Senator Clinton was, quote, ‘whining about the primaries.’"
Fineman soon came aboard and joked about the lack of "pro-drilling, anti-polar bear, and anti-abortion women" who were Clinton supporters: "Well, Keith, there are a lot of pro-drilling, anti-polar bear, and anti-abortion women among those 18 million Hillary supporters, I`m sure. I’m being facetious. I don’t think there are that many left. And I don’t think this really was about that. I think, in big picture terms, it was about John McCain seeking to change things up, to try to reestablish his maverick credentials because despite her lack of experience, Sarah Palin is a brave, political person, having taken on her own political party the way John McCain used to do." The Countdown host then asked: "Well, there’s something else here that’s sort of being overlooked in the sort of focus, ‘Oh, she’s a woman, oh, she’s a newcomer.’ Was her real appeal the fact that she is a red meat conservative? I mean, she is, as you suggested, pro-drilling. She’s this side of ‘melt the Arctic,’ this side of ‘imprison abortionists,’ she’s run up the debt, ‘purge the lefties’ fire-breather." While answering a question from Olbermann about why McCain was giving up being able to use the issue of experience against Obama by picking Palin as his running mate, Fineman made his claim that Obama is substantially more experienced than Palin: "[McCain has] done it at great cost because the whole Republican convention -- I was told, and was reporting for the magazine and on the Web -- was going to be the slogan, ‘He’s not ready to lead,’ meaning Barack Obama. Well, Sarah Palin makes Barack Obama look like John Adams. I mean, it’s just, it’s no contest." A rare bright spot from Olbermann came during an interview with Air America’s Rachel Maddow when the Countdown host elaborated a bit on the investigation of Palin over her attempt to have a state trooper who was her brother-in-law fired, which makes Palin’s position sound sympathetic because of the state trooper’s violent tendencies. Olbermann: "And the investigation that`s going on of the governor in Alaska. This is really a non-starter for her critics, as juicy as it might seem on the surface, right? I mean, she may have fired the guy who didn’t fire the trooper who had been married to her sister, but the guy was beating up the sister and tasering their 11-year-old kid. I mean, no woman would see that and would not give her a round of applause, and the same goes for a lot of men, too. That’s a non-starter politically, right?" A bit later, during an interview with Washington Post columnist Eugene Robinson, Olbermann labeled Palin as "hard right." Olbermann: "The McCain answer to [Obama’s] speech last night, which included, by my count, like 19 punches to McCain in that speech, there was a tepid statement last night. Today everything was Miss Wasilla for VP. Did they not, did the McCain camp not need to hit back hard after last night because if he chooses a hard right, global warming-denying, pro-drilling, lifetime NRA member as an answer to Obama’s speech, isn’t that McCain saying, in effect, ‘I agree with everything Barack Obama just said about me’?" KEITH OLBERMANN, IN OPENING TEASER: Which of these stories will you be talking about tomorrow? McCain picked Michael Palin from Monty Python? JOHN MCCAIN: Governor Sarah Palin of the great state of Alaska. OLBERMANN: The 20-month veteran, the two-term mayor of Wasilla, Alaska, population 9,236, the mayor who won the award for tree care from the National Arbor Day Foundation in 2002, the governor who was for the Bridge to Nowhere before she was against it -- the Sarah Palin? Senator McCain`s "Hail Mary" described as the biggest political gamble of our time, picking an ex-beauty queen governor on the job only 20 months, fanatically anti-abortion and pro-gun, in a desperate play for Hillary Clinton supporters. SARAH PALIN: It turns out, the women of America aren’t finished yet, and we can shatter that glass ceiling once and for all. OLBERMANN: Who in the heck is she, besides the fact that she really wanted to be a sportscaster for ESPN? And how desperate is McCain to trade his entire experience platform for her? Well, after last night, probably pretty desperate. BARACK OBAMA: Senator McCain likes to talk about judgment, but, really, what does it say about your judgment when you think George Bush has been right more than 90 percent of the time? OLBERMANN: The day after for the Dems, which happens to be the third anniversary of the day Katrina struck and John McCain’s 72nd birthday. MCCAIN: Thanks for reminding me. 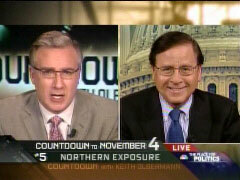 OLBERMANN: The countdown to 2008, Michael Moore joins us. OLBERMANN: Good evening from Denver. This is Friday, August 29th, 67 days until the 2008 presidential election. Senator John McCain has just gambled his chances of becoming President on a running mate whose political experience above the level of mayor of a hamlet consists of exactly 635 days as the governor of the 47th most populous state in the union. Senator John McCain has on his 72nd birthday, just traded in his ticket’s lead and experience for a person who could succeed him to the presidency at any moment whom until today he himself had met only twice. Our fifth story on the Countdown, Northern exposure. The Republicans have selected the least experienced vice presidential candidate probably in American history – a rabid conservative, seemingly a vague kind of alternative to Hillary Clinton, except that last March, the governor claimed Senator Clinton was, quote, "whining about the primaries." Governor Sarah Palin of Alaska – Senator McCain’s unexpected, though not total surprise pick – today had a rally in Ohio. Howard Fineman and Rachel Maddow, in a moment. If you went to bed last night believing that Minnesota`s Governor Tim Pawlenty would be standing on that stage in Dayton, well, then you just got McPunked. Senator McCain choosing the day Senator Obama’s historic speech here in Denver, the anniversary of not only his birth but also of hurricane Katrina, to make a little history of his own. MCCAIN: I’m very happy today to spend my birthday with you and to make an historic announcement in Dayton. OLBERMANN: In case you had not noticed, the selection of Governor Palin adding a new pronoun to this race. Suffice to say that Senator McCain noticed. MCCAIN CLIP #2: -a devoted wife and a mother of five. OLBERMANN: And, no, he didn’t vote for the women`s suffrage bill. Senator McCain, a four-term Capitol Hill veteran. Governor Palin, not so much. MCCAIN: She’s not, she’s not from these parts, and she’s not from Washington. OLBERMANN: In her remarks, Governor Palin recognizing that women who had blazed her trail that Hillary Clinton voters might still be undecided after the Democratic National Convention purely coincidental. PALIN CLIP #1: I can’t begin this great effort without honoring the achievements of Geraldine Ferraro in 1984 and, of course, Senator Hillary Clinton who showed such determination and grace in her presidential campaign. PALIN CLIP #2: It was rightly noted in Denver this week that Hillary left 18 million cracks in the highest, hardest glass ceiling in America, but it turns out the women of America aren’t finished yet, and we can shatter that glass ceiling once and for all. OLBERMANN: Determination and grace now. She said in March that Clinton was whining. From the campaign trail in Pennsylvania, Senator Obama calling Governor Palin to congratulate her, telling her she would be a terrific candidate and wishing her luck, but not too much luck. Senator Clinton saying of the nomination today in a statement, quote, "We should all be proud of Governor Sarah Palin’s historic nomination, and I congratulate her and Senator McCain. While their policies would take America in the wrong direction, Governor Palin will add an important new voice to the debate." Something that might come in handy at the debate. The only vice presidential debate, October 2nd in St. Louis. Governor Palin’s first official flip-flop of this campaign may come into effect then, having said in 2006 that she was for Alaska`s infamous Ted Stevens "Bridge to Nowhere," today insisting she had been against it. PALIN: And I’ve championed reform to end the abuses of earmark spending by Congress. In fact, I told Congress, I told Congress, "Thanks, but no thanks on that ‘Bridge to Nowhere.’"
OLBERMANN: Time now to call in MSNBC political analyst Howard Fineman – also, of course, senior Washington correspondent for Newsweek magazine. Howard, good evening. OLBERMANN: This wasn’t really a bid for Hillary supporters, was it? I mean, A, if you’re trying to poach Clinton women, you would announce this before the Democratic healathon, right, not on the day after it ends, and, B, last March at your own magazine’s women and leadership event, quoting the Newsweek article about it, she felt kind of bad she couldn’t support a woman, but she didn’t like Clinton`s, quote, "whining." So, the Hillary alternative just called Hillary and the PUMA’s whiners? FINEMAN: Well, Keith, there are a lot of pro-drilling, anti-polar bear, and anti-abortion women among those 18 million Hillary supporters, I`m sure. I’m being facetious. I don’t think there are that many left. And I don’t think this really was about that. I think, in big picture terms, it was about John McCain seeking to change things up, to try to reestablish his maverick credentials because despite her lack of experience, Sarah Palin is a brave, political person, having taken on her own political party the way John McCain used to do. He wanted to underscore the desire for change and the fact that he gets it. And he wanted to, frankly, shake things up and make it not seem so boring. And on that basis alone, I`m thankful to him because making a pit stop back here in Washington before I go out to Minneapolis and St. Paul, and I wasn’t looking forward to having to write about either Mitt Romney or Tim Pawlenty. No dishonor to them but this makes it fun, this makes it interesting. OLBERMANN: Well, there’s something else here that’s sort of being overlooked in the sort of focus, "Oh, she’s a woman, oh, she’s a newcomer." Was her real appeal the fact that she is a red meat conservative? I mean, she is, as you suggested, pro-drilling. She’s this side of "melt the Arctic," this side of "imprison abortionists," she’s run up the debt, "purge the lefties" fire breather. FINEMAN: I think that’s the basis of it. She’s been very popular. Even though she’s not been around all that long, she`s been a very popular person out there on the radio talk show circuit. An example, John Steigerwald, who is the big conservative talker there in Pittsburgh, which is in a key place on KDKA. He told me months ago, he said, "I don`t like any of these Republican candidates, none of them are really conservatives. The only one I really like is Sarah Palin." And he said this many months ago. I mention it because it`s a swing area. She`s going to -- they`re going to think that she can appeal in western Pennsylvania, in eastern Ohio and the West Virginia Panhandle and parts of Michigan because of her pro-gun, anti-abortion, pro-home schooling, conservative credentials. Conservatives love her. She is a, she is a real star at the conservative grassroots in a way John McCain has never been and could never dream of being. Because of that, she’s not going to get a lot of those Hillary votes. She’s not going to get those. She’s going to help McCain, the McCain people feel, get the people, the swing voters in rural parts of the Northeast that McCain was not yet locking in. OLBERMANN: Steigerwald, by the way, just to complete this, another ex-sportscaster. FINEMAN, LAUGHING: That’s all right, yes. OLBERMANN: This had been, this had been viewed widely as maybe Senator McCain’s best weapon against Obama. He just turned this in. Why give that up for her? FINEMAN: Well, for the reasons I said. Because he hadn’t established himself at the grassroots of the Republican Party, because he wanted to be an agent of change, because he wanted to try to restore his maverick credentials. I mean, that’s what the McCain people were telling me all day today. A maverick just picked a maverick. But, yes, he`s done it at great cost because the whole Republican convention -- I was told, and was reporting for the magazine and on the Web -- was going to be the slogan, "He’s not ready to lead," meaning Barack Obama. Well, Sarah Palin makes Barack Obama look like John Adams. I mean, it’s just, it’s no contest. So, I don`t get it, but, you know, they wanted to take the gamble. And the funny thing is, you know, I`d written that McCain was going to pick somebody he knew and could trust. He was the squadron leader. This would be his wing person, if you will. He didn’t know her from Adam, but he picked her based on the political problems he has, and he’s going to have to deal with it and answer with it. She makes a great first impression. As I say, she’s brave. But can she take the scrutiny she’s going to get in the next two months? OLBERMANN: Yeah, they had talked once before he called her about this possibility earlier by, I guess, about a week ago. OLBERMANN: Last point, Howard. I realize Senator McCain would have been slammed if he’d picked Romney or Lieberman because they were fairly close to his age, but do any Republicans worry that voters will worry or the Republicans themselves worry, that your presidential candidate is a 72-year-old cancer survivor and your presidential backup still points to one of her greatest political achievements being the time she talked to the Alaska Bicycle Center into donating a $58 helmet with cage to the town of Wasilla? FINEMAN: Well, you know, the McCain people bristle at this, but it’s a problem. I’ve spent a fair amount of time in Alaska, I don’t think I`ve been in that town, but it`s a big state, a wonderful state with great people but not all that much going on. And she doesn’t really, I talked to people who know her well, she’s really good on energy issues and so on. She doesn’t know the world, she doesn’t know foreign policy, she’s got a lot to learn in a big, fat hurry. OLBERMANN: Howard Fineman of MSNBC and Newsweek. Great thanks for your time and safe travels. OLBERMANN: And the investigation that`s going on of the governor in Alaska. This is really a non-starter for her critics, as juicy as it might seem on the surface, right? I mean, she may have fired the guy who didn’t fire the trooper who had been married to her sister, but the guy was beating up the sister and tasering their 11-year-old kid. I mean, no woman would see that and would not give her a round of applause, and the same goes for a lot of men, too. That’s a non-starter politically, right? RACHEL MADDOW: Well, I mean, if what she says about the trooper is true, I want to go up there and taser the guy myself, absolutely. But it, I mean, it should be noted that it was the state legislative council that decided to proceed with this investigation against her. And that’s a bipartisan group. It’s both Democrats and Republicans, state senators and state reps. They not only decided that this warranted investigation -- her behavior in this -- but that they would spend $100,000 of state funds to appoint an independent investigator to look into it. They’re now looking to hurry up her deposition in this case. And so, well from the outset, what we know about the details of this seem like this probably isn’t something that’s going to be easily politicized. At least within Alaska, in a bipartisan way, they thought her conduct was serious enough, her alleged conduct was serious enough here that they wanted to spend some good money going after her on this. OLBERMANN, TO EUGENE ROBINSON OF THE WASHINGTON POST: The McCain answer to the speech last night, which included, by my count, like 19 punches to McCain in that speech, there was a tepid statement last night. Today everything was Miss Wasilla for VP. Did they not, did the McCain camp not need to hit back hard after last night because if he chooses a hard right, global warming-denying, pro-drilling, lifetime NRA member as an answer to Obama’s speech, isn’t that McCain saying, in effect, "I agree with everything Barack Obama just said about me"?